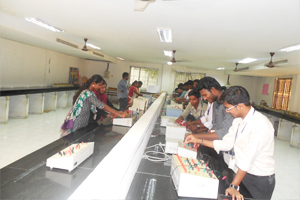 The power electronics lab is one of the most well established laboratories in the department of electrical and electronics engineering equipped with all the advanced facilities worth of Rupees 14 lakhs. The lab has a carpet area of 500m² and is one of the biggest laboratories. This laboratory provides facilities for learning various power device characteristics, Ac to Dc converters, choppers, Cyclo converters, PWM inverters and other power electronic circuits. For research and career development of staff and students in the key areas of power electronics simulation the lab provides facilities with PC’s and software’s like Pspice, MATLAB,ORCAD and Multisim .The students are constantly motivated to indulge themselves in mini projects as well as main projects in the field of power electronics . There is also excellent faculty strength in the field of Power Electronics to carry out research in the laboratory. It is a teaching lab for electrical machines. There are provisions for studying the characteristics and testing of various types of electrical machines. The lab is equipped with loading facilities for motors and generators and meters of different ranges. The work benches are built very safe and large enough to carry out the experiments comfortably. This laboratory is fully equipped with major equipments like Alternators, DC generators and motors, Synchronous motor, Single and Three phase induction motor, Single and three phase transformer. The department has a fully equipped laboratory with modern equipments like servomotors, synchronous and a synchronous position control system, controllers, compensators, pressure measurement trainer kit, thermocouple trainer kit, flow measurement trainer kit, AC and DC bridges trainer kit The lab is also equipped with advanced computing tools like MATLAB and ORCAD.The course is designed to inculcate in students, a fundamental understanding of the theory and design of modern and classical feedback control system via transfer functions and state variables. This Lab helps the student to get familiar with the fundamentals of electronics devices, PCB design, Fabrication techniques and basic knowledge in house wiring. This laboratory is fully equipped with major equipments like Cathode Ray Oscilloscope , Function Generator , Linear and Digital IC tester, Digital Multimeter, Dual Regulated DC Power Supply (variable), Single Regulated DC Power Supply ,Energy Meters ,Autotransformer (Single Phase), Hand driven Megger, ,Assorted electronics components and electrical measuring instruments.